Description and Definition of the Knife and Dagger: The Knife and Dagger are weapons used by Native American Indians in hunting and fighting. A dagger is a a short knife with a double-edged pointed blade fastened to a handle and used for stabbing or thrusting. A knife is a general term used to describe a thin bladed weapon, having a sharp edge for cutting and fastened to a handle, but of many different forms and names for different uses e.g. throwing knife, scalping knife. A knife or dagger was always carried by the Native American Indian. They varied in size and would be held in a sheath at their side or small knives were hung around the neck. Many Native American weapons, such as the knife and dagger were made from a combination of materials. The blades were attached to a wooden handle with a cord usually made from animal sinew or with a type of glue. The blades of the Native American knife and dagger were originally made of bone, antlers and stone. The knife and dagger were designed with wooden handles and sharpened stone edges which could be used as deadly weapons for throwing and close combat. The arrival of the white settlers and traders, introduced new ideas and technology and the original Native American knife and dagger made of stone, horn, bone and stone were replaced with blades made with metals such as iron and steel. 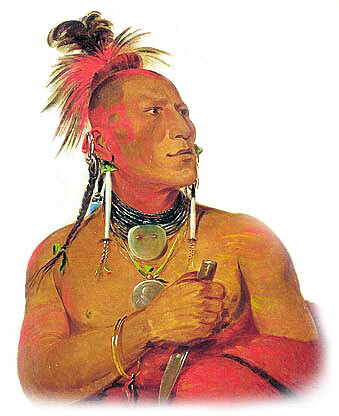 Making weapons, such as the Knife and Dagger, was an essential role of all American Indian men. Making a Knife and Dagger was a time consuming task. The Native American knife and dagger were made with many different styles and types of blades. The pictures on the page illustrate some of the different knife blades made by the Indians. The Knife and Dagger was carried by Native Americans in Knife Sheaths held at their sides or carried around their necks.